When a concrete surface is no longer providing safe, solid support due to settlement issues, prompt action is necessary before the problem gets worse. Before you demolish the concrete slab, consider the advantages of PolyRenewal®, an innovative alternative to common concrete remediation methods like mudjacking, concrete grinding, and total concrete replacement. The PolyRenewal® system utilizes a high-strength polyurethane mixture that expands to fill voids under concrete, stabilize soil, and lift concrete slabs. With multiple formulas available, PolyRenewal® can fit the needs of any commercial, industrial, or municipal job, large or small. Tar Heel Basement Systems is a certified PolyRenewal® contractor, serving Lexington, Winston Salem, High Point, Greensboro and surrounding North Carolina and Virginia areas. Schedule your consultation with one of our commercial technicians today to learn how we can lift your sunken concrete slab using our fast, durable, cost-effective solution. Lightweight – PolyRenewal® weighs about 4 pounds per cubic foot, which is significantly less than the 120 pounds of typical fill material. This means there is almost no additional load added to the supporting soils. High Capacity – Lifting action is a result of the expansion of the foam, allowing lift on much larger loads than typical mudjacking that relies on hydraulic pressure being contained under the slab. Accurate Lift – Calculated reaction time of the polyurethane foam allows for precise lifting. Small 5/8″ diameter holes are drilled through the slab. After an injector port is screwed into each hole, a special nozzle mixes two reactive materials and sprays the expanding mixture beneath the slab. Waterproof – Polyurethane material is waterproof, so it will not wash out and can be used to under-seal the slab and stop other infrastructure leaks. Non-Invasive – Equipment can be used in tight access areas, is less messy than other methods, and can be done more quickly. Concrete grinding, a common concrete repair technique, is loud, messy, and disrupts the area around the concrete. Quick Cure Time – Cure time allows for even heavy traffic just 15 minutes after completion of the injection of the material. With mudjacking, the injected mortar must be allowed to cure before any weight can be put on the slab – a process that can take several days. See how PolyRenewal® works to lift settled, damaged concrete slabs. Pressure grouting with urethane. 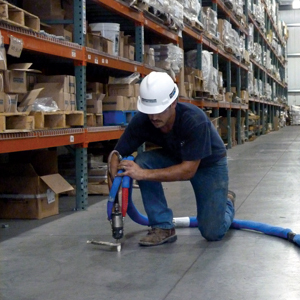 This technique is also referred to as “polymer injection,” and can be used for concrete lifting, void filling applications, and consolidating and strengthening soil prior to construction. The urethane polymer is activated during the application process, turning from a liquid into an expanding foam that flows into voids and pushes sunken concrete upwards. Rescuing a sinking in-ground pool. The combined weight of concrete and water can sometimes be too much for the underlying soil to bear. When this happens, an in-ground pool can begin to sink down. Tar Heel Basement Systems can solve this problem by injecting an expanding polymer compound beneath the pool. The polymer’s expanding force can raise up the sunken pool, while also improving the load-bearing qualities of the soil. With multiple formulas available, PolyRenewal® is able to fit the needs of any job, large or small. Concrete is hard to beat as a basic material for all kinds of load-bearing surfaces, from driveways and sidewalks to floors, roads, and airport runways. However, concrete has two characteristics that can cause problems: it’s heavy and it can’t stretch. The weight of a concrete slab can sometimes cause the soil beneath the slab to compress. When this happens, all or part of the concrete slab will sink down under its own weight, sometimes cracking in the process. The cracking occurs because concrete isn’t a resilient material. If a slab is unevenly supported, it’s likely to crack because it can’t stretch or bend. Tar Heel Basement Systems is your local expert for concrete leveling and repair. Contact us today to schedule an on-site consultation to find out how PolyRenewal® can solve your all your concrete problems, and we will provide you with an estimate for your commercial project. We proudly service Asheboro, Burlington, Kernersville, Thomasville, Mt. Airy, Reidsville, and many surrounding neighborhoods.